A projectile is any object propelled through space by the exertion of a force that ceases after launch. In a general sense, even a football or baseball may be considered a projectile. It can cause damage (injury, property damage) to a person, animal or object it hits, depending on factors including size, shape, speed and hardness. Accordingly, in practice most projectiles are designed as weapons. Arrows, darts, spears, and similar weapons are fired using pure mechanical force applied by another solid object; apart from throwing without tools, mechanisms include the catapult, slingshot, and bow. Other weapons use the compression or expansion of gases as their motive force Blowguns and pneumatic rifles use compressed gases, while most other guns and firearms utilize expanding gases liberated by sudden chemical reactions. Light gas guns use a combination of these mechanisms. Some projectiles provide propulsion during (part of) the flight by means of a rocket engine or jet engine. In military terminology, a rocket is unguided, while a missile is guided. Note the two meanings of "rocket": an ICBM is a missile with rocket engines. Many projectiles, e.g. shells, contain an explosive charge. With or without explosive charge a projectile can be designed to cause special damage, e.g. fire (see also early thermal weapons), or poisoning (see also arrow poison). Projectiles which do not contain an explosive charge are termed kinetic projectile, kinetic energy weapon, kinetic warhead or kinetic penetrator. Classic kinetic energy weapons are blunt projectiles such as rocks and round shot, pointed ones such as arrows, and somewhat pointed ones such as bullets. Among projectiles which do not contain explosives are also railguns, coilguns, mass drivers, and kinetic energy penetrators. All of these weapons work by attaining a high muzzle velocity (hypervelocity), and collide with their objective, releasing kinetic energy. Some kinetic weapons for targeting objects in spaceflight are anti-satellite weapons and anti-ballistic missiles. Since they need to attain a high velocity anyway, they can destroy their target with their released kinetic energy alone; explosives are not necessary. Compare the energy of TNT, 4.6 MJ/kg, to the energy of a kinetic kill vehicle with a closing speed of ten km/s, which is 50 MJ/kg. This saves costly weight and there is no detonation to be precisely timed. This method, however, requires direct contact with the target, which requires a more accurate trajectory. With regard to anti-missile weapons, the Arrow missile and MIM-104 Patriot have explosives, but the Kinetic Energy Interceptor (KEI), Lightweight Exo-Atmospheric Projectile (LEAP, see RIM-161 Standard Missile 3), and THAAD being developed do not (see Missile Defense Agency). A kinetic projectile can also be dropped from aircraft. In this approach, the explosives of a regular bomb may be replaced with concrete, for a precision hit that causes less collateral damage. A typical bomb has a mass of 900 kg and an impact speed of 800 km/h (220 m/s). This method is also applied when training personnel in the act of dropping a bomb with explosives. It was used in Operation Iraqi Freedom and the subsequent military operations in Iraq by mating concrete-filled training bombs with JDAM GPS guidance kits, to attack vehicles and other relatively "soft" targets located too close to civilian structures for the use of conventional high explosive bombs. A kinetic bombardment may involve a projectile dropped from Earth orbit. A hypothetical kinetic weapon that travels at a significant fraction of the speed of light, usually found in science fiction, is called a relativistic kill vehicle (RKV). 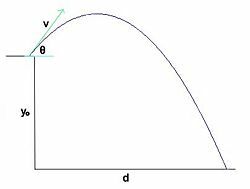 The path of this projectile launched from a height y0 has a range d.
Ballistics analyze the projectile trajectory, the forces acting upon the projectile, and the impact that a projectile has on a target. A guided missile is not called a projectile. The term projectile also refers to weapons or any other objects thrown, shot or otherwise directed to enemies in video games or computer games. ↑ Jim Randle (October 7, 1999), Concrete Bomb Correspondent Report, Pentagon. Retrieved January 14, 2009. This page was last modified on 3 June 2015, at 18:47.